Pepperoncini are a type of pepper that is harvested at the green to yellow stage, before it reaches its full maturity. This pepper has great nutritional value as a source of Vitamin C and E and is also rich in antioxidants. Del Destino Pepperoncini vary in size from 3 to 6 centimeters and its flavour ranges from sweet to fairly hot. 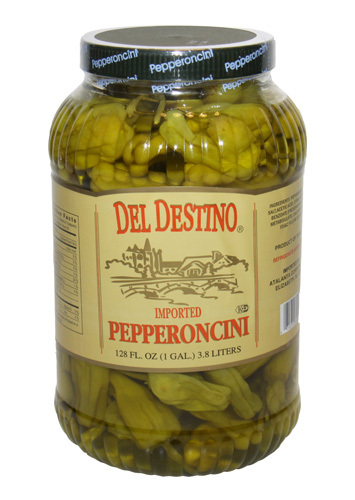 Del Destino Pepperoncini are available either whole or sliced and are packaged in clear plastic jars with a unique lid equipped with a handle making it easy to carry. A strainer is also provided inside the jar that enables the peppers to bathe in the brine, thus prolonging their shelf life. Del Destino Pepperoncini are excellent in various salads, such as Greek salad or Chef's salad; they are also delicious as cold antipasto, and for more flavour, add them to your favourite sandwiches.